← Who designed the WTC memorial? that has expectations of pure light-hearted escapism, why is this? long hours, but it’s more than that. It’s impossible to be autonomous, independent. true, it feels like a job I don’t particularly like. At times. It’s exhausting. feels much closer to home, where you began, than the intention might have been. finally, I made it out to my lab in the bondoo to start unpacking my final machine. can you get here? !” Never have I skiied so fast!! the icebergs, the reflections of the sun through clouds and onto the water below. by water molecules, and only water molecules! I live in a giant frozen ocean! to pitch your tent. How amazing is that?! How convenient! I love it so much. is a field camp. It’s great. and a large drilling tent. That’s it. is one of those camping bags hanging on a hook holding melted snow. Chilly. 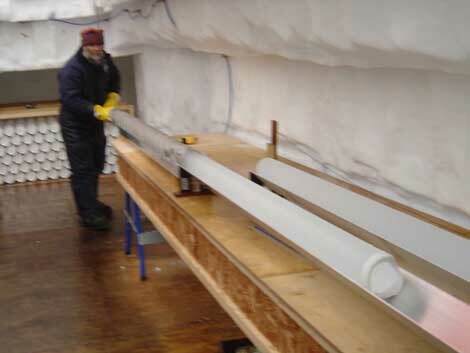 engineering equipment, retrieving ice that was first deposited 5000 years ago! shards bounce. Amazing and beautiful to see. even get the world service up here! at all. It’s miles from anywhere. Very soon, only eighteen people will be here, living in these blocks on twigs. no reason for us to be here. It’s the furthest place in the world from civilisation. in the middle of nowhere, far, far, far away from the politics of the world. This here is an antarctic base. It’s great. Simply wonderful and fantastic news! I am so happy that you got this trip. And also great for me to remember Genevieve visiting here at the house. Makes it all feel so much closer. Love to all of you out there making your scientific and personal discoveries. You don’t know me, but my brother, Simon, is one of the Halley winterers. He pointed me to your diary and I really enjoy reading your entries – it’s good to see things from a different perspective. I thought I’d leave a comment because if you need somebody to vent to, I can wholeheartedly recommend my brother. He’s totally trustworthy (and I’ve told him some good secrets in my time!) and a good listener with it. It’s probably the thing I miss most about him so you might as well take advantage of it while he’s there! When I read your posts, in my mind’s eye we’re having a conversation and you are explaining something very enthusiastically. You definitely write like you talk, and it’s evocative stuff, some of my favorite reading on the web. And I want more. PS What is your hair situation like nowadays? 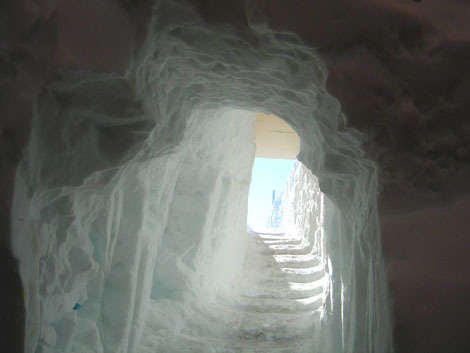 Great pic of the ice stairs in the snow. If it wasn’t so white, I would think you were in Egypt. Another great word picture of your experiences and feelings down there. I felt like I was looking over your shoulder during your visit to the island. Keep up the postings, you can vent to us anytime! Glad to hear you are in the wars, cutting yourself and living a normal life with poltics and crap – it might bring you back to earth at times but its good for us to know you are still on our planet! Squishes and hugs and kisses and venting outlets when needed..
oh how I love reading your brain – brings my day to life in new ways and reminds me of the wonderfully intricate simplicities of life in sydney, toronto, london, cambs, leeds, antarctica, NY NY, dorset, wherever.